Posted by Jon in News, Playmates, TMNT with 0 comments. Attention fellow TMNT fans, the best part of a new series is upon us: the toy launch! ‘Rise of the Teenage Mutant Ninja Turtles’ toys and role play from Playmates will be hitting shelves starting October 1st. They have a great lineup of action figures and other items planned for the series, which includes a 43-inch tall sewer lair playset. That’s right, it’s the biggest playset EVER in a TMNT line! El Segundo, CA (September 19, 2018) – Cowabunga – the heroes in a half shell have returned with a whole new look! Playmates Toys announced today that its Rise of the Teenage Mutant Ninja Turtles toy line will be available at major retailers starting October 1. 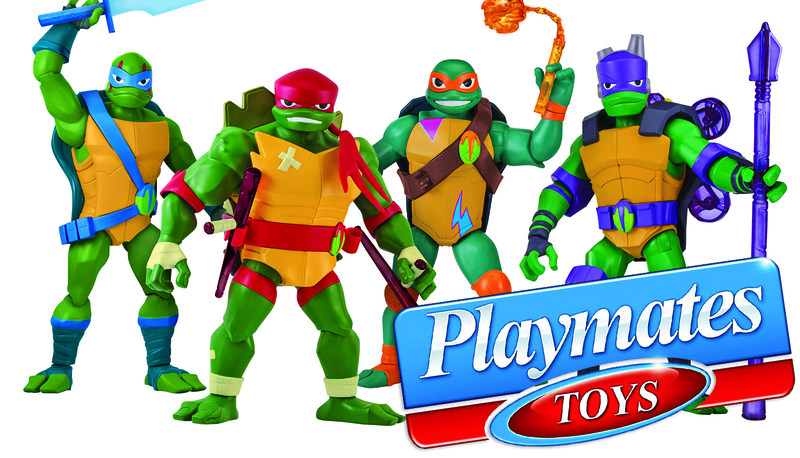 As the longtime master toy licensee for Teenage Mutant Ninja Turtles, Playmates Toys developed this all-new product line based on Nickelodeon’s brand-new animated series, Rise of the Teenage Mutant Ninja Turtles, which premiered on September 17, 2018. The toy line includes an assortment of highly detailed action figures, as well as vehicles, a playset and role play toys. The highly detailed Action Figures are uniquely sculpted and fully articulated. The assortment features the four Turtles, April and Splinter, as well as new characters Baron Draxum, voiced by WWE Superstar, John Cena, Meat Sweats and others introduced in the series. The Deluxe Ninja Action Figures, available in the 4 Turtles, are ready to take out the bad guys! The figures bend to activate incredible flipping action, with each Turtle letting out an action shout as they flip. The Giant Figure assortment stands between 10.25” and 11” tall, with 13 points of articulation. The Turtle Tank is the new group vehicle that will help get the Turtles to the action fast. The tank is 2 toys in 1, transforming from vehicle mode into a Mobile Ops unit with a towering secret lab for Donatello. With the Shell Hog Vehicles, the Turtles can rev up for some shell-kickin’ Turtle action, and the vehicles even connect to each other and can also launch off the Turtle Tank group vehicle. Discover where Splinter and the Turtles live, play and train with the 43″ Epic Lair Playset, which is the biggest playset ever from Playmates Toys. It includes four levels of play, seven rooms and over 20 action features. The assortment of Role Play, available for each of the 4 Turtles, features a signature Turtle bandana, a newly designed throwing star and the all-new weapon for each of the Turtles! With a history of over 50 years, Playmates Toys is today among the most well-respected and innovative marketing and distribution companies in the global toy industry with a proven history in the creation of imaginative products as well as the development and management of profitable, long-term brand franchises. Key brands include Teenage Mutant Ninja Turtles, Kuroba, Ben 10, Voltron Legendary Defender and Tiny Toes. From its offices in Hong Kong and California, Playmates designs, develops, markets and distributes its products in over 60 countries worldwide. For more information, visit http://www.playmatestoys.com.